All suites are fully airconditioned for winter and summer temperatures. The Springbok Hotel has a stunning beer garden and BBQ area where you can relax and enjoy an evening BBQ around the fireside with friends and family. Breakfast is served in the diningroom. Enjoy a full English breakfast, fresh fruit in season, cereals, yoghurt and a selection of bread and jams from the buffet. Enjoy the ambience of the renowned Springbok ladies bar where you can enjoy a relaxing drink, a bar lunchand a game of pool. Should you require car hire, we will gladly assist in providing you with details. Enquire at our front desk for information. The Springbok Hotel has outstanding fully airconditioned conference facilities including a plasma screen, overhead projector, flipcharts, writing pads and pens. Full catering and accommodation can be included in conference packages. Contact us to book your conference now. Need a gift? The Springbok Hotel has several display cabinets with beautiful handcrafted curios on sale. Dinner is served buffet style in the spacious diningroom from 19H00 - 22H00 hours. 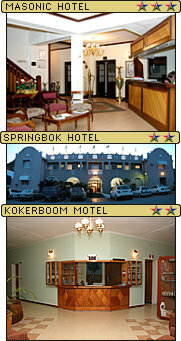 The Springbok Hotel caters for weddings, birthdays, product launches or any special occasion. Don't leave your golf clubs at home as there's an 18 hole golf course where you can enjoy an exciting round of golf. For contact information enquire at reception. All suites are equipped with hospitality trays for you to enjoy a refreshing cup of tea or coffee at your leisure. Limited internet and fax facilities are available at reception. Photocopy facilities available. Each suite is provided with a key. Please ensure that your key is handed in at reception prior to departure. Children are most welcome at our hotels. We speak English and Afrikaans. We provide a laundry service at a nominal charge. Should you require specialised dry cleaning, this must be requested in advance. Lunch packs and picnic baskets are gladly arranged for guests wishing to enjoy a day out visiting flower reserves and site seeing. Please order in advance at reception to avoid disappointment. Parking is safe in a fully lit designated parking area. Room service is available up to 22H00. Room service includes bar, breakfast, dinner, light lunches and bar lunches. There are safe facilities for guests' valuables. Enquire at reception. Smoking is permitted in designated areas as per government regulation. Telephones are provided in some of our suites. For those suites which do not have telephones, calls may be made from reception and will be charged to your account. J C Botha Hotels provides tour facilities which must be requested in advance. Please contact either the front desk or call Pieta +27 (0) 27 712 2685 for assistance in arranging a day tour or longer. CLICK HERE for more on our tour packages. A weather/flower report is provided on a daily basis during the flower season to guide you on your journey. Why not subscribe to our regular newsletter? Hear about our seasonal and corporate special rates, tours and seasonal flower reports. We tell you more about this historical town, its mining history and the wonderful floral kingdom which brings visitors from all over the world. We tell you more about places to see and things to do in and around Springbok. Read more on Goegap Nature Reserve, Richtersveld Transfrontier National Park, Skilpad Flower Reserve and the Hester Malan Wild Flower Garden. The JC Botha Hotel Group offers you guided customised tours of Namaqualand from 1 to 8 days. Places to see and things to do when visiting one of our star graded establishments in Springbok. We're centrally situated to enable scenic day trips to several interesting towns and villages. You can soon view the JC Botha semi precious gem collection at the Masonic Hotel. This magnificent collection of semi precious rocks and stones has been collected by JC Botha over a period of many years and kept in pristine condition. The gems will be on view in the foyer of the Masonic Hotel.